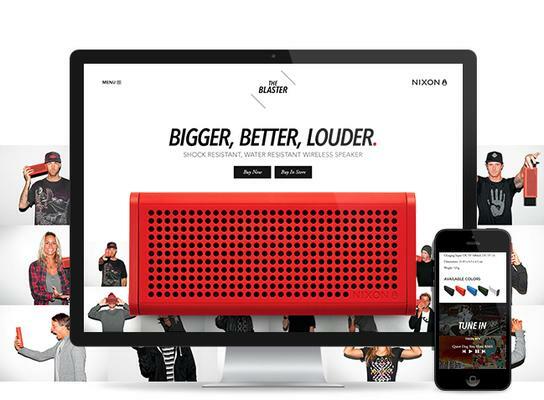 Cuker recently partnered with premium watch and accessories brand Nixon to launch the campaign microsite promoting Nixon’s new innovative, shock and water resistant wireless speaker The Blaster. Cuker designed and developed a cutting-edge responsive and paralax microsite that will serve as the hub of Nixon’s international campaign for the new product. To view the Nixon Blaster microsite, visit Nixon.com/Blaster or view our case study here. Founded in 1998 in Encinitas, CA, Nixon is the premium watch and accessories brand for the youth lifestyle market. Focused on making the little stuff better, Nixon began with a small line of team-designed, custom-built watches sold exclusively in specialty boardsport and fashion retailers. Currently distributed in over 90 countries, Nixon’s product range has grown to include select men’s and women’s softgoods, leather goods, and custom audio products. For more information, please visit: Nixon.com and Facebook.com/Nixon.